Metal security box that is lockable with a padlock or cable lock (not included). 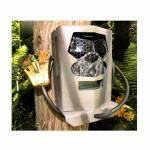 Mounts to a tree with a cable lock or lag bolts from the inside of the unit. Fits Models: DLC COVERT SPECIAL OPS CODE BLACK - 2015 Model DLC COVERT EXTREME BLACK 60 DLC COVERT EXTREME RED 40 DLC COVERT CODE BLACK AT&T MOSSY OAK (2861) DLC COVERT CODE BLACK AT&T BROWN (2854) DLC COVERT CODE BLACK VERIZON MOSSY OAK (2991) DLC COVERT HD 60 (2878) DLC COVERT HD 40 MOSSY OAK (2892) DLC COVERT HD 40 REAL TREE.. Adds an important layer of security to your favorite game camera. 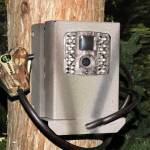 With the Bear Safe Box you can add even more security to your expensive scouting camera. Features a heavy-duty all-metal housing. Rock-solid enclosure locks with a padlock and screws directly to the tree (neither lock or screws are included). Protect your camera from all types of "Varmints". Fits Moultrie Models: A-30, A-30i, A-35, A-40, A-40i (Cable lock not included) .. 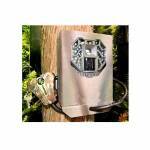 Adds an important layer of security to your favorite game camera. 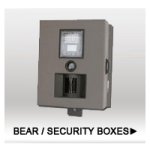 With the Bear Safe Box you can add even more security to your expensive scouting camera. Features a heavy-duty all-metal housing. Rock-solid enclosure locks with a padlock and screws directly to the tree (neither lock or screws are included). Protect your camera from all types of "Varmints". Fits Moultrie Models: M-40 M-40i (Cable lock not included) .. 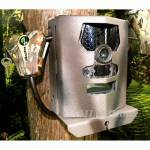 Adds an important layer of security to your favorite game camera. With the Bear Safe Box you can add even more security to your expensive scouting camera. Features a heavy-duty all-metal housing. Rock-solid enclosure locks with a padlock and screws directly to the tree (neither lock or screws are included). Protect your camera from all types of "Varmints". Fits Moultrie Models: MV1 Modem (Cable lock not included) .. 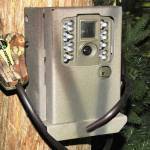 Adds an important layer of security to your favorite game camera. With the Bear Safe Box you can add even more security to your expensive scouting camera. Features a heavy-duty all-metal housing. Rock-solid enclosure locks with a padlock and screws directly to the tree (neither lock or screws are included). Protect your camera from all types of "Varmints". Fits Primos Models: 63054 (Proof Cam 01) 63055 (Proof Cam 02) 63056 (Proof Cam 03) .. 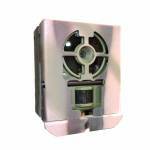 Protect your investment with a Metal Security Box. Whether you are taking pictures of game or using your game camera for security, lock it up in a bear proof metal box and protect your game cameras. Fits models: Stealth Cam STC-G34 Pro Stealth Cam STC-G45NG Pro .. 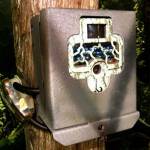 Adds an important layer of security to your favorite game camera. With the Bear Safe Box you can add even more security to your expensive scouting camera. Features a heavy-duty all-metal housing. Rock-solid enclosure locks with a padlock and screws directly to the tree (neither lock or screws are included). Protect your camera from all types of "Varmints". Fits Stealth Cam Models: PX14 PX18CMO PX22 PX36NG .. 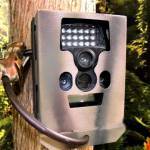 Adds an important layer of security to your favorite game camera. 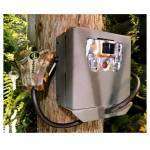 With the Bear Safe Box you can add even more security to your expensive scouting camera. Features a heavy-duty all-metal housing. Rock-solid enclosure locks with a padlock and screws directly to the tree (neither lock or screws are included). Protect your camera from all types of "Varmints". Fits Stealth Cam Models: DS4K, G26NGX, GXW 22MP Wireless (Cable lock not included) .. 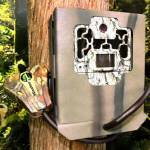 Adds an important layer of security to your favorite game camera. 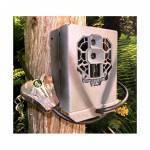 With the Bear Safe Box you can add even more security to your expensive scouting camera. Features a heavy-duty all-metal housing. Rock-solid enclosure locks with a padlock and screws directly to the tree (neither lock or screws are included). Protect your camera from all types of "Varmints". Fits Moultrie Models: CLOAK 4 LIGHTSOUT (K4b1) CLOAK 4 (K4i1) CLOAK 6 (K6i2) CLOAK 6 LIGHTSOUT (K6B2) CLOAK 6 (K6i20t) CLOAK 6 3D-6M.. 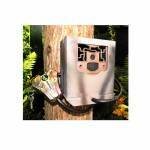 Protect your investment with the Bushnell Bear Box. Includes keyed padlock. For Wireless model 119599C only. ..
CamLockBox Security Box for Browning Dark Ops Sub Micro cameras. Fits Browning Strike Force HD (BTC-5HD), Browning Dark Ops (BTC-6HD), Browning Strike Force (BTC-5) and Browning Dark Ops (BTC-6) trail cameras. 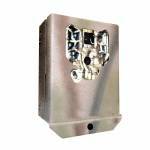 All-Steel security lock box designed to provide exact camera fit. Allows camera to be taken in & out and still point back to same spot. Powder coated with a camo break-up paint applied. Protect your camera from varmints, bears, weather and theft. Box can be lagbolted, bungeed or belted to ..
CamLockBox Security Box for Muddy Pro Cam Cameras. Protect your investment with a Metal Security Box. Whether you are taking pictures of game or using your game camera for security, lock it up in a bear proof metal box and protect your game cameras. Manufactured with all-steel construction to provide exact camera fit - this allows the camera to be taken in/out and still point back to the same spot. 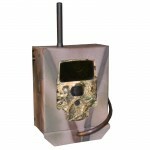 Fits models: Muddy Pro Cam 10, Muddy Pro Cam 12 Powder coated with a camo break-up camo ..
CamLockBox Security Box for Wildgame Mirage Trail Cameras. All-Steel security lock box designed to provide exact camera fit. Allows camera to be taken in & out and still point back to same spot. Powder coated with a camo break-up paint applied. Protect your camera from varmints, bears, weather and theft. 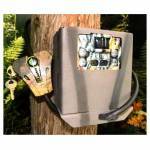 Box can be lagbolted, bungeed or belted to the tree, and is lockable with a padlock or cable lock (not included). 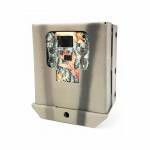 Fits the following cameras: MIRAGE 14 LIGHTSOUT (M14B1) MIRAGE 14 (M14i1) ..
CamLockBox Security Box for Wildgame Terra Trail Cameras. 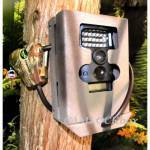 Fits Wildgame Innovations Terra 5 (TR5i1), Terra 6 (TR6i33D) & Terra 6 trail cameras. All-Steel security lock box designed to provide exact camera fit. Allows camera to be taken in & out and still point back to same spot. Powder coated with a camo break-up paint applied. Protect your camera from varmints, bears, weather and theft. 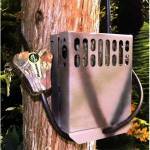 Box can be lagbolted, bungeed or belted to the tree. 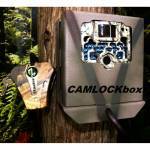 ..
CamLockBox Security Box for Wildgame Vision Trail Cameras. Fits Wildgame Innovations Vision 8 Lightsout (V8B20), Vision 8 (V8i7), Vision 8 Lightsout (V8B7), Vision 8 (V8i20), Vision 12 IR & Vision 10 trail cameras. All-Steel security lock box designed to provide exact camera fit. Allows camera to be taken in & out and still point back to same spot. Powder coated with a camo break-up paint applied. Protect your camera from varmints, bears, weather and theft. Box can be lagbolted, bungeed or belte..
Metal security box fits Browning Command Ops Pro cameras to protect them from thieves and vandals. Can be locked with a standard padlock or Masterlock Python cable lock (not included). Fits Browning cameras: BROWNING COMMAND OPS PRO (BTC-4P) BROWINING COMMAND OPS PRO (BTC-4-14-P) ..
Metal security box fits Browning Spec Ops HD cameras to protect them from thieves and vandals. Can be locked with a standard padlock or Masterlock Python cable lock (not included). Fits Browning cameras: Range OPS XV (BTC-1XV) Command OPS (BTC-4) Command OPS (BTC-4-14) ..
Metal security box fits Browning Command Ops Pro cameras to protect them from thieves and vandals. Can be locked with a standard padlock or Masterlock Python cable lock (not included). Fits Browning cameras: BROWNING STRIKE FORCE PRO (BTC-5HDP) BROWNING DARK OPS HD PRO (BTC-6HDP) ..
Metal security box fits Browning Command Ops Pro cameras to protect them from thieves and vandals. Can be locked with a standard padlock or Masterlock Python cable lock (not included). Fits Browning cameras: BROWNING STRIKE FORCE PRO XD (BTC-5PXD) BROWNING DARK OPS PRO XD (BTC-6PXD) ..
Metal security box fits Browning Spec Ops HD cameras to protect them from thieves and vandals. Can be locked with a standard padlock or Masterlock Python cable lock (not included). Fits Browning cameras: Spec Ops HD (BTC-8FHD) Spec-Ops Platinum (BTC-8FHD-P) Browning Recon Force HD (BTC-7FHD) Browning Recon Force Platinum (BTC-7FHD-P) ..